Samsung PS59D6900 review | What Hi-Fi? Yes, we did a double-take, too. With a shrewd bit of shopping, this 59inch plasma TV really is that cheap. In anyone’s book this looks like a bit of a bargain, and you could be extremely tempted to jump to the conclusion that this is a ‘no-brainer.’ Well, can you just hold that thought? The attraction of the Samsung is made all the stronger because of its feature set. On paper, this is far removed from the realm of stripped-down budget TVs. Four HDMI inputs are dotted along the side of the screen, and one of which is ARC-enabled – so you can channel the TVs sound into the HDMI output of a compatible home cinema amp. The PS59D6900 doesn’t sacrifice anything in terms of smart functionality, and the inclusion of integrated wi-fi makes connecting to Samsung’s extensive Smart Hub portal all the easier. From here you can use all manner of streaming services from the internet, access content stored on devices on your home network and keep up to date with all your social media accounts. Even the TVs appearance doesn’t let the side down. It’s relatively slender by plasma standards, with a brushed-effect bezel and a clear trim running right along the edge. Touch-sensitive controls are tucked away on the bottom left-hand corner of the screen, making for a neat and attractive-looking set. It’s just a shame that the picture quality doesn’t really hit the mark. We aren’t expecting the world from a 59in TV costing this much, sure, but we still have standards that need to be met. The D6900’s colour balance is its main strength – its ability to paint vivid yet natural hues during Avatar should be applauded – but there’s plenty of room for improvement elsewhere. Black levels are just about OK by cheap plasma standards and there’s a lack of realism to images compared with rival screens. It also seems as though the screen is covered in a haze, which robs the picture of clarity and depth. During the closing chapters of X-Men: The Last Stand, the picture lacks contrast and vibrancy. Motion isn’t handled especially well either, and there’s more than a hint of instability during fast-paced action. Standard definition broadcasts from the Freeview HD tuner are watchable, if a little on the grainy side. The step up to high-definition content helps firm-up the edges, but there’s still the odd twitch with movement, and there are still traces of on-screen noise. A surround sound system or soundbar of some sort is a must with this set, as the built-in speakers sound splashy, bright and devoid of any real bass. We also noticed a buzzing sound eminating from the screen. This isn’t unheard of when talking about plasma TVs, but it was more noticeable on this model. 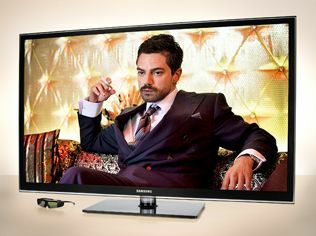 If you’re looking for a huge-screen television on a budget, then the Samsung fits the bill. Unfortunately, the trade-off for something this affordable is a drop in picture quality.